Imagine a group of friends from South Carolina in a lecture hall during college listening to the story of The Desire of Air involving the famous philosopher Socrates. It just so happens that they play together in a band but are at a crossroads in their lives; unsure in which direction they want to take their music and sound. They continue to listen to the story about a student who asked Socrates what his purpose was in life. As the story goes, Socrates took the student into the nearby sea and started to push his head under the water, essentially drowning his pupil. Socrates then pulled him up from the water, the student desperately gasping for air but still trying to understand how his incidental drowning pertained to the original question about the purpose of life. Socrates explained that when you desire your true purpose as much as you desire your NEED TO BREATHE, there lies the true nature of your purpose in this life. The Desire of Air story is a famous lesson among philosophy professors. It resounded though with that particular group of friends who not only listened, but in essence digested their lesson and eventually named their band NEEDTOBREATHE. Fast forward to the present and NEEDTOBREATHE has come a long way from that lecture hall in South Carolina. Selling out big name venues across the country like Colorado’s Red Rocks Amphitheater, San Francisco’s Fillmore, and Nashville’s Ryman Auditorium the band has become a force in the music industry. The grammy-nominated rock band is comprised of brothers Bear Rinehart (vocals, guitar) and Bo Rinehart (guitar, vocals), Seth Bolt (bass, vocals), and Josh Lovelace (keys, vocals). NEEDTOBREATHE has managed to not only top the Billboard charts with their past two albums but their latest album Hard Love debuted in July 2016 at #2 on the Billboard 200 just behind Drake’s Views. 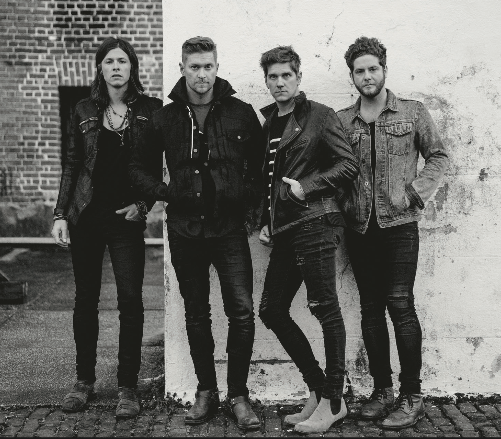 NEEDTOBREATHE’S music can be described as rootsy with a southern country/bluegrass feel. The band has also been categorized as a Christian rock band which might be a tribute to some of the band’s lyrics and background of the two Rinehart brothers who grew up singing gospel, with a father for a pastor. Although the spiritual message lingers and the roots of uplifting gospel melodies can be heard on some of the newer tracks, their latest album goes in a much different direction from the rest of their discography; musically speaking. In conjunction with their album Hard Love the band announced an extensive three-leg ALL THE FEELS TOUR. The first leg of the tour will be performed in amphitheaters and feature special guest, grammy-nominated singer/songwriter Gavin DeGraw, with whom the band released their smash hit “BROTHER” in 2015. The second leg of the tour will be through notable rock clubs around the country, and the third leg is a stint through renowned theaters and music halls for what is labeled as “An Evening with NEEDTOBREATHE” – the band’s first ever acoustic tour. NEEDTOBREATHE is no stranger to the Omaha metro area and have been culminating fans and followers with their momentous popularity for a number of years. The band is set to perform for the third year in a row at the Harrah’s Stir Concert Cove on September 21st. The performance at Stir Concert Cove will be part of the band’s first leg of the tour featuring singer, Gavin DeGraw. For more information about tour dates and performances check out NEEDTOBREATHE online at Needtobreathe.com.